While there is a lot of debate about “cat people” versus “dog people,” there are some people who prefer to have much smaller pets. Known in pet stores and in the veterinary industry as “pocket pets” because of their size, the keeping and caring for small rodents as pets is not just limited to school children. 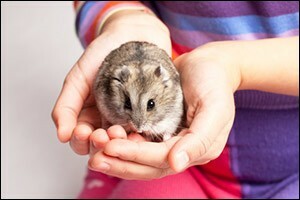 There are many adults who love having small pets, such as guinea pigs, mice, rats, hamsters and gerbils. It is important to learn as much as you can about your small pets before you adopt them. For example, guinea pig care and feeding is much different than what is required for keeping a hamster. While they might seem similar and the cages, food and bedding found at the local pet store are all on the same aisle, they each need their own unique type of care. Consider taking a visit to Anchor Animal Hospital in Dartmouth to speak with the veterinary staff about the care and feeding required for keeping small rodents as pets before you bring one home. The team can help you with information regarding habitat, temperature control throughout the year, basic feeding and nutrition, bedding suggestions and cautions, as well as grouping for people who want more than one pet at a time. It is good to have a vet that you can take your pocket pets to, as not all veterinary practices have staff members who specialize in their care. Anchor is a Southeastern Massachusetts emergency vet and clinic that specializes in the care and treatment of a wide variety of animals, including small rodents. When it comes to keeping small rodents as pets, there are many obvious advantages over larger animals like cats and dogs. They do not take up a lot of room and they are much more affordable to take care of and adopt. Many species, such as rats, can be tamed to do tricks and interact with all of the members of your family, but when it comes to choosing the best type of pocket pet, it is all about you and how much time you can devote to this new member of your family. While not all rats, hamsters or mice will get the same illnesses – or any illnesses for that matter – during their lifetime, it is important to know what illnesses most commonly affect each species so you can be on the lookout for any signs of trouble. If your pet appears ill or something is wrong, take them to the local Southeastern Massachusetts emergency vet or call Anchor Animal Hospital in Dartmouth to schedule an appointment to address any concerns. Do not wait. Chances are that if you are concerned, something could really be wrong. MICE – It is important to know that mice do not have a very long lifespan. Tail trauma is common in mice, so it is important to tell anyone who might handle your pet to never pick them up by the tail. In some cases, the skin can actually slip off their tails, leaving bare and unprotected bone and tissue exposed to germs and infection. Mite infestations are also common, which can cause thickened skin, flaky skin, dry itchy skin and hair loss. GUINEA PIGS – Proper guinea pig care and feeding can help these animals to live a long and healthy life. They are chosen as class pets frequently because they can be trained and socialized to interact with all members of the family if care is taken to do so. Make sure to ask about habitat, bedding, chew toys and nutrition in order to meet the needs of this particular pet. RATS – Upper respiratory infections and mammary gland tumors are common ailments of rats. Respiratory infections are quite contagious and the symptoms include tearing, running nose and sneezing. It can be treated if caught early by your local vet. Mammary gland tissue is found nearly all over the rat’s body, so tumors can be found anywhere. Most are not cancerous, but can cause rats problems due to their large size. Your local animal hospital in Dartmouth can surgically remove these tumors if you get your pet into the veterinarian in time. HAMSTERS – Mites, diarrhea, hormonal diseases and broken limbs are the most common problems seem in hamsters by veterinarians. Wire cages can catch feet and break paws and legs. Diarrhea is commonly known as “wet tail” in hamsters and, if not tended to immediately, can result in death due to hydration. Bring your hamsters to your Southeastern Massachusetts emergency vet for best results. Mites are very common and do more damage than just make your pet itchy. GERBILS – Increased infections, behavioral problems and extreme stress can result if too many gerbils are kept together. Best when adopted at a young age from a reputable breeder who has already socialized them, a tame gerbil will be able to interact well with humans. Tumors can develop on a bare patch of skin on the stomach of the gerbil. The tumor can be removed if caught early enough. Watch out for respiratory and gastrointestinal infections as well. If you are in need of care and support for your small rodents as pets, look no further than Anchor. Our team is highly trained, experienced and qualified to help you learn more about guinea pig care and feeding, proper care for rats and mice, habitats and substrates for hamsters and gerbils, plus a whole lot more. As a Southeastern Massachusetts emergency vet and animal clinic, we see a lot of different types of pets. To find out more about our services or to schedule an appointment for a check-up, please give us a call at 508-996-3731.